As with all new games, there are some things that seem obvious once you know them but that for some reason aren’t otherwise very clear. 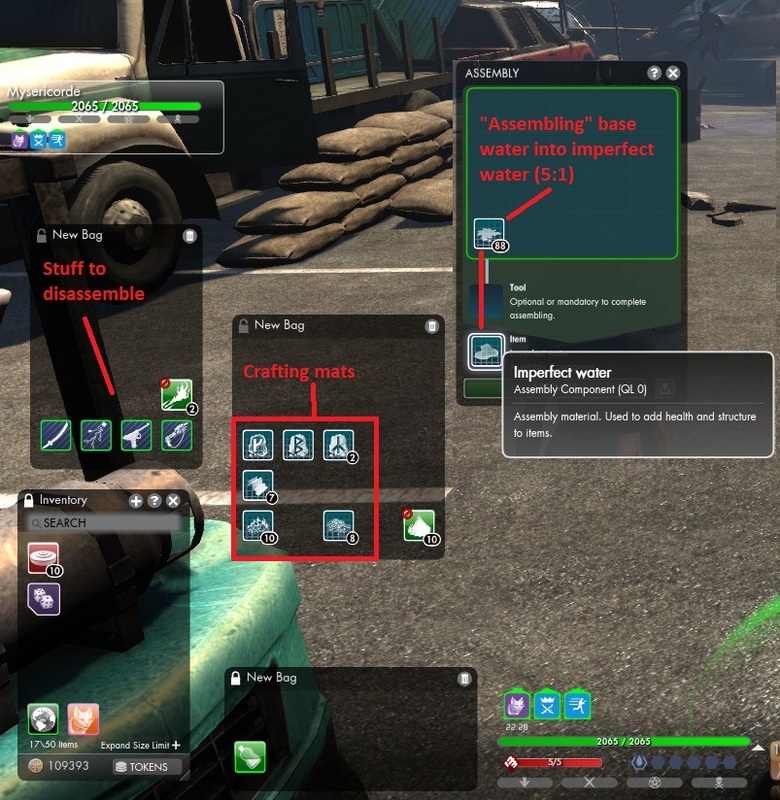 Almost all missions in The Secret World are repeatable after a certain interval of time has passed. Check your Mission Journal (J) – there’s a drop-down menu that will show your current missions, paused missions and completed missions (with timers if they’re repeatable). TSW isn’t built like your average MMO, with quest hubs that you devour before moving on. Missions are scattered here and there across the map, telling the story of the people (or beings or corpses or whatever) that are in that area. Most missions will lead you to areas where you can find other missions, but some are hidden out in the wilds. You won’t lose out if you never find those – it’s the story mission and some of the “major” (red/yellow) missions that are important to do at least once, as they will open up content further down the road. You should pick a second weapon as soon as possible, even if you don’t do much with it for a while. Every character in TSW can wield two weapons – even weapons you’d think are 2-handed (Assault Rifles, Hammers, Dual Pistols, etc.) are “one-hand” for game purposes and you can still wield a second weapon. The game is built on that premise. To wield anything but the most basic Quality 0 items, you’ll need a skill of at least 1 in that weapon type, but that’s not hard to acquire. The VERY FIRST mission in Kingsmouth, “For A Fistful of Zombies,” rewards you with a weapon – so you can upgrade your current primary on Day 1 and pick a secondary 18 or so hours later when the mission resets. There’s also a quest near “Moose” outside the Sheriff’s office that will not only teach you the basics of disassembly/crafting but also let you craft a weapon of your choice. Just because Moose gives you a shotgun to disassemble doesn’t mean you should make a shotgun – the instruction book you have to look at for the mission includes pix of all the weapons you can make. Ta-da! Secondary weapon. Early stages ProTip: Every mission you do in Kingsmouth will reward you with Solomon Island sequins. There’s a Council of Venice vendor in front of the house behind the Sheriff’s office who sells some lovely blue QL3 gear and glyphs. There’s lots to choose from and it ain’t cheap, but it won’t be long before you have at least one QL3 weapon without needing to run Dead in the Water (Polaris) before you’re ready. What you get from her after that, if anything, is up to you. Every character can acquire every single skill and ability in the game. Hence the generally-touted “no need for alts” (which hasn’t stopped me of course). It takes a while, but it’s possible. – Each weapon has a skill (hit K to open the skills window) and each skill is made up of two lines. Weapon skill is how good you are at using that weapon – if your skill is too low, you’ll miss (glance) a lot. – The upper line is always damage, and the lower line will vary depending on the weapon’s main secondary purpose. It can be either Healing, Survivability or Support. Clicking on a weapon ability will open up the two lines and give you some idea what a weapon is intended for. – If the secondary line is Survivability, you’ll find that related abilities have a lot of damage mitigation and possibly some reactive healing; if it’s Support, you’ll find a lot of buffs and debuffs in that weapon’s abilities; and if it’s healing… you can expect to find healing abilities. – Each weapon also has a host of associated abilities, which represent the various things you can do with a given weapon – the much-screenshotted ability wheel. This post will tell you a lot more about both. So you can stop asking about skill and ability resets. There aren’t any, because they’re not needed. Want to try some Blade abilities because they look cool but worried that you aren’t using a blade? Save up some Skill Points (SP) and Ability Points (AP), get a blade, and start developing your skills. Go back to an easier zone if needed – you don’t “wear out” zones and missions remain repeatable, so while there’s a certain amount of diminishing returns as you get more powerful, you can still build up enough points to make yourself useful with your new chosen weapons. Your total Inventory space may be limited, but you can “open” as many bags as you may need. Bags are essentially just a virtual way to categorise your stuff. If you want one huge single window, go for it. If you want 10 smaller ones, go for it. Your choice. Check out the screenshot below to see what I mean. Your ‘main’ inventory window is the one called… wait for it… Inventory. It shows how much money you have, how many items you’re carrying and how many you can carry (X/Y items), allows you to add bags or inventory space and includes a button that opens the Tokens window, which is where your special currency goes. To add more INVENTORY space, i.e. to be able to carry more items, hit the Expand Size Limit + link at the bottom of the main inventory window. It’ll cost ya, but it’s worth it and you can keep doing it. To add a new BAG so you can store potions, disassembles, crafting materials and whatever else separate from everything else, click the + button at the top of the main Inventory window. To delete a bag (which only gets rid the visual representation, not the items themselves), click the trash can icon on the bag you want to be rid of. To rename a bag, click in its name bar and… rename. The Padlock icon to the left of each bag’s name allows you to “lock” that bag in an open state. It doesn’t lock it in place on-screen – all it does is prevent that bag from being closed when you close your main inventory. It’s wise to make at least one of these to hold your combat consumables. ALL inventory windows can be resized, even if only the main inventory actually has a little grab-handle in the lower right corner. Make as many bags as you want and make them whatever size and shape you want. It helps. You’ll forgive me if I disagree with you. There is no right or wrong in how someone decides to play an MMO. You have your playstyle, I have mine — and looking at yours, you’re playing TSW as though it’s WoW and racing to the end. Your choice. I choose to play differently. I hereby prophesy that Max will be complaining in the next 2-3 weeks time about the “lack of content” in TSW. You can buy Q0 weapons from the CoV guys by the Sherriff’s Office in Kingsmouth, as well. Also, you can wield weapons and talismans that are one rank about your current skill level; meaning when you start, you’ll have 0 skill in everything, and can wield rank 1 weapons and talismans. The one you get from “Fistful of Zombies” is Q1 and you can use it immediately. Also worth noting – as far as I can tell, leveling (gaining SP/AP) in TSW is linear. But I imagine others have made it farther can clarify that, perhaps I’m just not far enough into the game to be able to tell a difference. Leveling is actually static; every “exp bar” worth of exp requires the same amount of exp. Which is to say, you can go back and bring Deputy Andy those bullets every 18 hours or so for as long as you like, and you’ll get the same profit therefrom. If a mission yields 1sp worth of exp the first time you do it, it’ll yield 1sp worth of exp every time. Thanks FS, that’s what I was thinking, but I hadn’t crunched the numbers to be sure. Tell FS he needs to restart his own blog! He has total TSW Mad Skillz! But he’s a slacker! And a cantankerous old man who repeats himself. And… yeah, I ought to write more.